Eyes are beautiful, and rather useful, too. From a single light-sensitive cell evolution has fashioned us quite elegant and extremely practical organs. While they might be somewhat squishy, prone to trauma and infection, sometimes duped by visual illusions and in some people missing certain parts such as cones necessary for colour perception, they’re still pretty good overall. Taking a picture with the man-made equivalent of an eyeball – the camera – can yield interesting results. Take the red eye effect, for example. If the lighting conditions and the angle are just right, with a simple flicker of the camera flash your beautiful toddler is rendered into a creepy red-eyed demon. The red colour in those poorly lit flash photos comes from… you guessed it, blood. More specifically, it is the blood swishing about in the vascular layer at the back of the eyeball. That layer is also known as the choroid and is located behind the retina, namely the screen in our eyes that images are projected onto. A flash happens too quickly for the pupil to constrict as it normally would in a brightly lit situation, and the light of the flash reflecting off the back of the eyeball gets recorded by the camera. Hence the creepy red look. But that same effect accounts for more beautiful things, too. For example, in the eyes of some vertebrates, particularly the nocturnal ones, nestled in the choroid area is also a layer of reflective tissue called tapetum lucidum (Latin for ‘bright carpet’). This layer of cells is effectively a mirror – once light has already entered the eye, this layer reflects it back to the retina once more, and thus gives light receptors a second chance to catch it. Hence – better night vision. 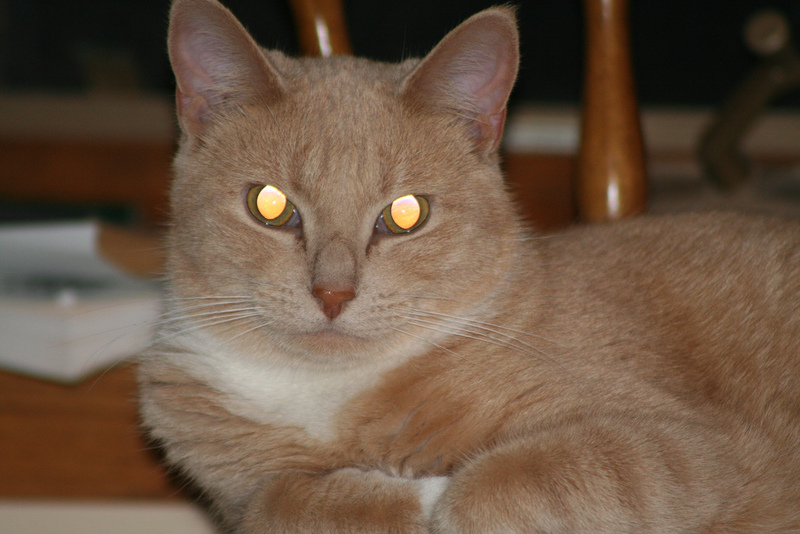 Tapetum lucidum is what makes animal eyes glow when struck by a flashlight in nighttime, an effect known as ‘eyeshine’. This iridescent, colourful layer of cells is most often comprised of crystals arranged in intricate structures. It’s what accounts for the golden glow of lemur eyes and the turquoise blue in deer. Evolution is indeed beautiful – even if it makes some flash photographs less so.